File photo of Boko Haram suspects on a trail. A Federal High Court sitting in Abuja on Wednesday discharged two suspects who had been arraigned for alleged ties with Boko Haram insurgency. The suspects were discharged due to lack of diligent prosecution by the government. 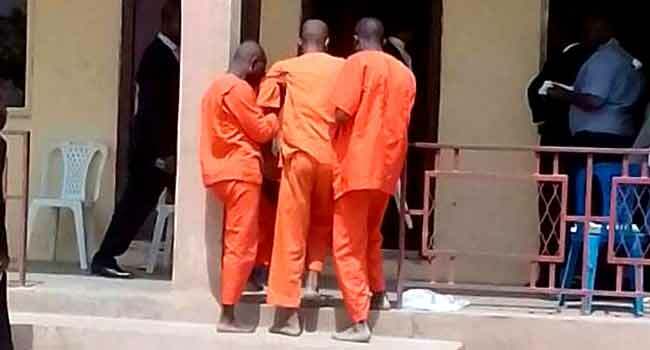 While discharging the defendants, Justice Binta Nyako said that Ibrahim Ahmed had been in detention since 2013, while Sani Argungu had been detained since 2012 without the case proceeding to trial. The judge blamed it on the failure of the government to call any of its witnesses adding that the defendants could be re-arraigned whenever the prosecution was able to get its witnesses to attend court. She added that the defendants, although discharged, would be monitored and warned them not to associate with any person of questionable character. Ibrahim, in his statement, confessed that he was a security guard at the government house in Sokoto. He was arraigned for allegedly giving passage to Boko Haram members.